During the year of 1983, the Group B design ideas moved from paper to prototype, as the car moved rapidly through the manufacturing stages. A little more than 8 months after Bott declared the project 'go', the first rolling prototype was finished and ready for its first official public appearance. As usual, the Frankfurt Auto Show was chosen for the unveiling of the new Porsche. Even in the waning hours of October 9th, the car was having finishing touches put on it to go on display the next morning. As the curtain was drawn the next morning, the Group B prototype became an instant celebrity. Porsche announced that the car was a total showcase of technology and special element, not to mention the speed that came along with the package. 200 production models would be built, and would only be available to carefully selected customers. 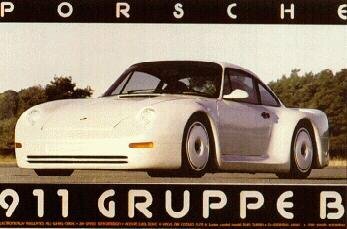 Herr Bott introduced the new Porsche: "The result is a car that offers every comfort, with the gentle handling and low interior noise levels of a normal roadgoing car, with the added benefit of ample safety margins." At the Frankfurt show, the price for the production models was announced at 250-300,000DM. After testing, the need for various air ducts was found. For the rest of 1983, 84, and most of 1985, that one Group B prototype underwent physical and mechanical surgery beneath the rooves at Weissach. 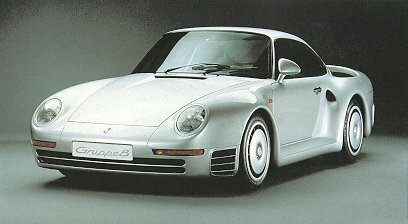 There was much work to be done in order to combine all the 959's technical aspects into one, smoothe, roadgoing package. 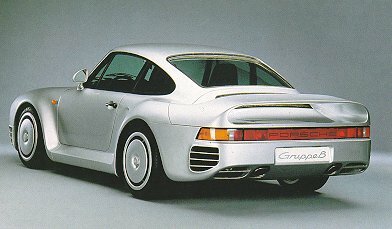 By the summer of 1985, the first definitive cars were sighted. 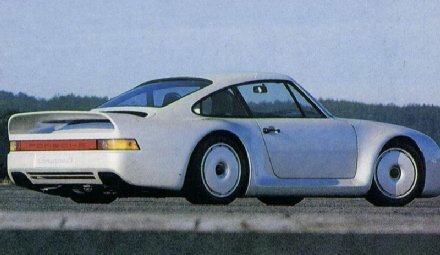 After the first two prototypes had been built, the bodywork was modified to include air vents in the front and rear wheel housings, as well as the intake holes behind the doors. The first prototype modified like this was code named 'F3', and was sacrificed in the first crash test. The crash test resulted in information that proved the car's basic concept was so real that occupants were better protected in this car than in ANY other car. At this time, the Group B project was halted and turned over to the production engineers for work on turning the prototyp into a street-legal reality.